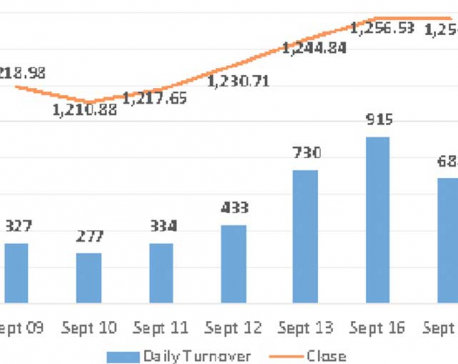 KATHMANDU, Sept 22: The stock market of Nepal began the week on a positive note adding to its previous week's gains. Sunday was marked by a gain of more than 11 points, where the Nepal Stock Exchange (Nepse) index made a 3-month closing high of 1,256.53 points. Despite closing essentially flat on Monday, the index further added more than 2 points on Tuesday to reach to a fresh high of 1,258.81 points. The bourse remained closed on Wednesday while the market corrected modest 3.74 points in the last trading session to finally settle at 1,255.07 points. Subsequently, the market posted a weekly gain of 10.23 points or 0.82 percent. With the gain experienced in the week, the market has closed higher for a fourth straight week. The recent surge came as investors continued to shrug off skepticism following two years of persisting downtrend. Hence, overall sentiment has remained upbeat with signs of a turnaround in the market. 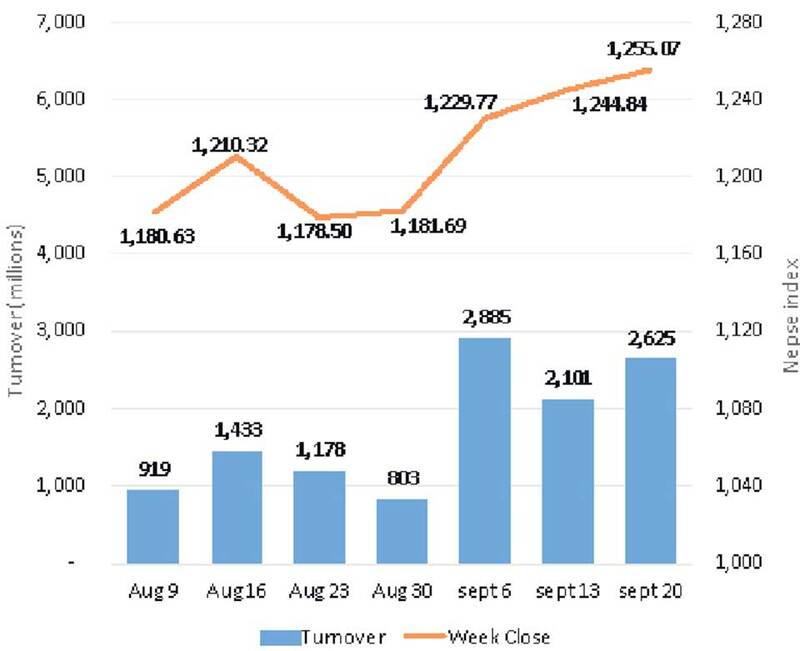 Market participation also seem to support the recent movement with the turnover increasing by almost 25 percent week-on-week to Rs 2,625 million. Sensitive Index, which gauges class 'A' stocks performance, also added 0.69 percent on the heels of the week's broad rally. In terms of sectoral performance, most of the sub-indices ended the week in green. Only Hotels and Finance sub-indices bucked the trend and declined 1.04 percent and 0.27 percent, respectively. Non-Life Insurance stocks showed a substantial move to the upside with its sub-index rallying over 3.26 percent. Manufacturing & Processing and Hydropower sub-indices also turned in some of the best performances with the sectors' sub-indices adding more than 2 percent each. Meanwhile, sub-indices of Life Insurance, Trading, Development Bank and Microfinance segments also closed the week fairly higher. Weekly stock-wise turnover list was mainly dominated by banking names. NMB Bank Ltd posted the highest turnover of over Rs 199 million in the review period. Similarly, NIC Asia Bank Ltd was also traded actively with a turnover of over Rs 121 million. This week market participation was also high among shares of Sanima Mai Hydropower Ltd with a total weekly transaction of over Rs 100 million. Further, Nepal Bank Ltd and Prabhu Bank Ltd were also actively traded. The only listing for the week includes bonus shares of Deva Bikas Bank Ltd. Nepse listed more than 2.47 million units of the respective scrip. On the announcement front, Kanchan Development Bank Ltd announced 11.29 percent dividend to its shareholders on Friday. While 5 percent will be distributed as bonus shares, 6.29 percent will be paid out as cash. Similarly, National Microfinance Bittiya Sanstha Ltd declared 40 percent dividend to its shareholders, including 25 percent stock dividend and 15 percent cash payout. As per the ARKS technical analysis, the market adding to its weekly gains indicates the overall sentiment still favoring bulls at present. However, the index has taken a breather posting modest moves in the preceding few sessions. Meanwhile, Moving Average Convergence Divergence (MACD) suggests short term uptrend still in action. A breakout of key 1,270 points mark might indicate a possible surge to 1,300 points in the short run.